This was the Isiah and Julius Show. 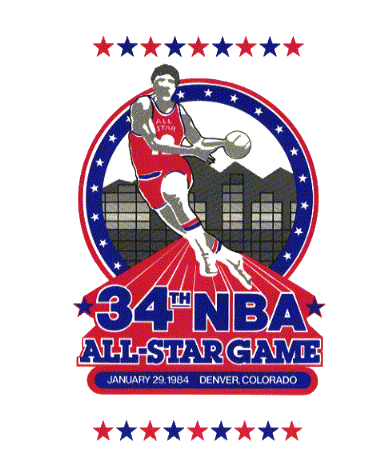 Detroit's Isiah Thomas scored all 21 of his points in the second half and Philadelphia's Julius Erving poured in a game-high 34 as the East rallied to defeat the West, 154-145, in overtime at Denver. Thomas, the 22-year-old point guard, also had 15 assists as the East overcame a 14-point halftime deficit to win its fifth straight. His performance in only the third All-Star Game to go into overtime (the East had won in 1954 and 1980) overshadowed a record-setting performance by Los Angeles' Magic Johnson. Magic's 22 assists for the West broke his All-Star mark of 16 set in 1983. The weekend also was noteworthy because it marked the introduction of NBA All-Star Saturday. After past greats performed in The Schick Legends Classic, Larry Nance of Phoenix dazzled the crowd at McNichols Sports Arena by beating Julius Erving in the Slam-Dunk Championship.